Morning Conversational: What’s OSU’s Biggest Remaining Question On Offense? Today’s Topic: What Is OSU’s Biggest Remaining Question On Offense? Spring refreshes and renews, providing nature with another new beginning, and the same holds true in college football. The newness fills the air with anticipation and opportunity, but there’s always some unanswered questions that will come wafting in on the breeze. And when you look at the Ohio State offense, there is going to have to be a healthy amount of renewing and refreshing. The Buckeyes must replace arguably the best quarterback in school history, a running back with over 2,600 career yards rushing, the school’s single-season receptions record holder — as well as two other end zone-frequenting receivers, and four starting offensive linemen. Throughout the 15 practices of spring ball, head coach Ryan Day and his coaching staff went about replacing those losses. Justin Fields and Matthew Baldwin have a long way to go, but if the quarterback is a product of the players around them, then they should be fine. Mike Weber and his nearly 3,000 yards rushing are gone, but JK Dobbins and his nearly 2,500 yards return. As do three other talented tailbacks. The losses at receiver are big, but the Buckeyes may still possess the deepest receiver room in the Big Ten. Losing four starters on the offensive line, however, is a concern. And without the entire picture this spring, there are questions remaining as to how things are going to go this season. Three new starters on the interior must be found, and while this spring went a long way in finding them, there are still some unknowns. 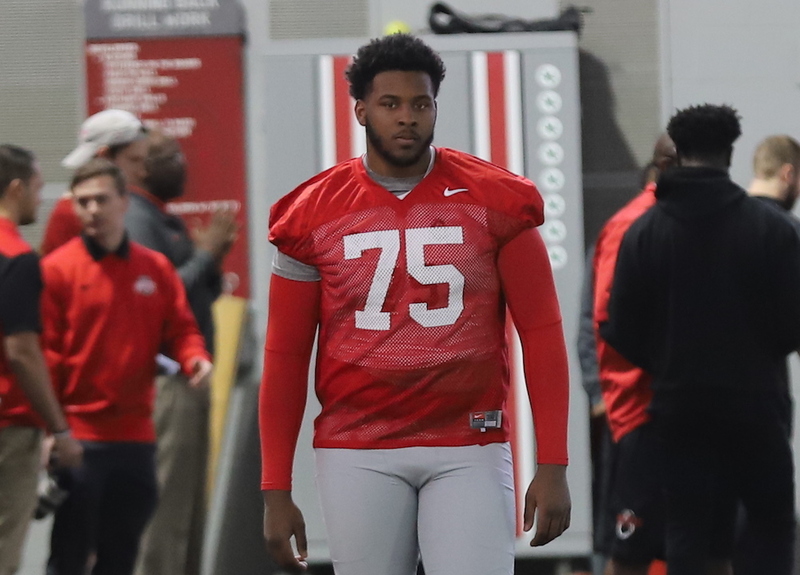 Graduate transfer offensive guard Jonah Jackson has yet to arrive, and many believe he will end up in the starting lineup when the Buckeyes kick off their season in late August. If that happens, you’ve got some other moving parts in the form of fifth-year senior lineman Branden Bowen, who can play guard or tackle. Three incoming freshmen are also going to be helpful in term of depth. Day’s biggest concern is finding those four new starters. The bodies and the talent are there, however. But the biggest question mark remains junior left tackle Thayer Munford. Munford missed the entire spring with a back issue, which is believed to be the same injury that kept him out of the Rose Bowl. Back issues are never to be taken lightly, but nothing the Ohio State coaches have said has indicated that this is the kind of thing that will keep Munford out this fall. Still, until he is on the field, it’s a concern and the most significant unanswered question for the offense right now. having to replace “starters” from last year should not be looked at as a negative. having to replace very good or elite starters would be, however. 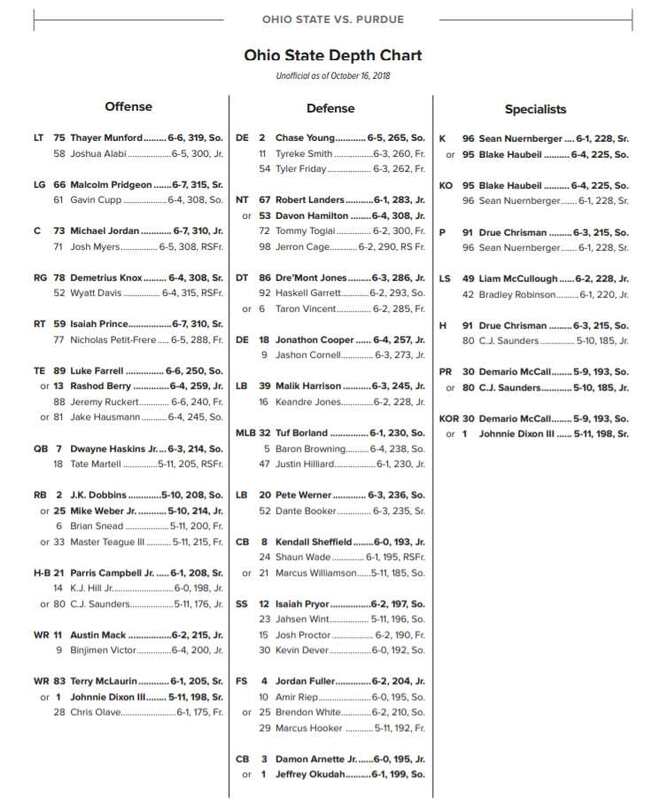 and from all the evidence of last year (and with exception of the center position) there were none on the OLine. and that fact alone was what jammed the gears of any kind of running game or even a threat of one. hopefully, this year’s group will be good, or very good, or maybe even elite. it would be a welcome change, actually. That’s all and good with recivers corp. You need a QB that can hit them with the ball. O line should come together considering the talent pool but time will tell. The D will need to carry the team early to give the offense time to try and gel. The running game will also need to carry the load early. Plenty of talent for the run game. From what I watched there is 3 Qb fighting to start. They all could be great Qb’s with time and maturity. It’s a matter of who fits in and who developes the best repor with the offense. GO BUCKS. BRING HOME THE BIG ONE. You nailed it, the OL and QB. Not so concerned with the QB, Fields adds the running ability of JTB, but right now not the accuracy of Haskins. The ladder will come. The OL is the biggest concern, it couldn’t establish the run, costing us at PUR and meaning close wins over NE, MN, IN, and MD, the damage wasn’t in the loss column, but national perception. Should the OL establish the run game, this will be not only a fun O to watch, but make OSU tough to beat especially when we head to our first real scary game at Lincoln. Weber’s loss hurts, the JTB and others can absorb the bulk of those yards. This will still be the best receiving core by far in the conference if not one of the best in the country. Yes, losing Campell, McLaurin and to a lesser extent Dixon are tough losses, but retaining Hill, Mack, Olave and an experienced Victor who is due for a breakout season shouldn’t result in much of a drop-off, if any. Add in some fresh new faces that have impressed (Garrett Wilson) along with a gutsy Saunders and I think this is the most deep we’ve been. Our TEs are back and experienced as well.